During the weekend i had a conversation with my mum where she was talking about mental illnesses and eating disorders and how they are doing alot more research regarding these areas and how mental illnesses arent a choice... though the fact that this isnt common knowledge is sort of scary. (I mean shouldnt people know by now that people dont choose an eating disorder, depression, anxiety or panic attacks or bipolar etc etc? It's not exactly something someone willingly chooses to live with and wants it a part of their life.) Anyway, my mum then reminded me that it wasnt my fault that i had developed an eating disorder in the past or that i struggled with mental illness and i told her that i never thought it was.... all the time i was sick i knew that it wasnt my fault, and i never blamed my mum either. However my mum then proceeded to tell me how she had been blamed very often during my years of illness... my mum had been the victim and person to blame for why i was sick. And i remember she had told me once before that while i was in hospital in Ireland all the blame had been put on my mother and she was constantly told by the doctor that she was a bad mother, she had raised me wrong etc and even in Sweden she got critisizm. Not to mention that she got critisizm from people in our family who told her that she had raised me wrong, that she was the reason i was sick and struggling. 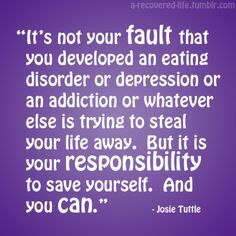 Hearing that made me so sad, because that is not the case at all... i dont think you can blame anyone for developing an eating disorder, i mean sure if there is trauma or abuse in family or relationships that can definitely be a trigger but there are people who go through trauma or abuse and dont develop mental illnesses because they cope in other ways (which arent necessarily better as they might turn to drinking or drugs, but still they cope in other ways than how a person deals with things when they have a mental illness). For me my mum has always been my rock and the person there who has supported me and the only one who ever listened to me. She tried to help me as best she could while i was sick, however i was very manipulative so i did abuse the fact that she listened to me and wanted me to be happy when the only thing that made me happy was to do what my eating disorder told me to do. 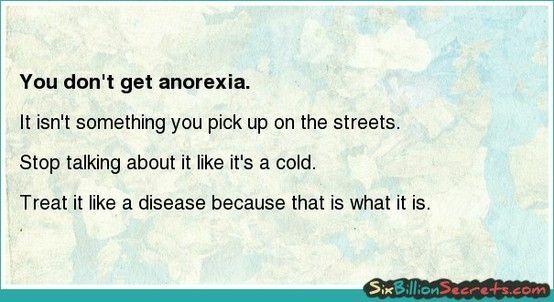 I think it is so outdated and old fashioned that doctors and people blame family for why a person develops an eating disorder, i mean in some cases it might be due to family problem. But for my mum she had to struggle with the fact that her daughter was starving herself, ready to jump infront of a train or die from a heart attack and at the same time being told that all of that was due to her and her raising me wrong... How awful is that? But i want to remind you all that it is NOT your fault that you struggle with a mental illness. And i know at times you can feel like a burden to everyone around you, i mean i still struggle with that and feel like a burden to everyone around me. But you arent... if people cant deal with the fact that you are struggling then they will walk away and LET THEM. That is one of the best things i have learnt, is that during the tough times the people who truly care will still be there for you. The people who walk out of your life when you struggle arent people you want in your life anyway, no matter how tough it may be. And of course people also have a right to leave when things get tough, sometimes you need to be the one to do that, for example if a friendship or relationship starts getting toxic to your own health physically or mentally then sometimes you neeed to leave even if the other person is struggling, but you know that you cant help and that being in that situation is just making things worse for you, and that needs to be understandable for both sides. But back to the actual topic. 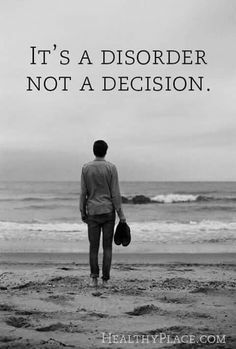 Nobody chooses a mental illness but you do have a choice to recover. Each day, each moment you have the choice to make a difference and make a change. 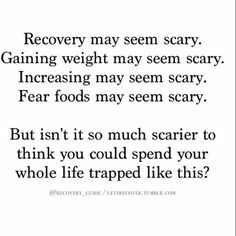 You might not choose to be sick but each time you choose to hurt yourself, each time you choose to skip a meal or each time you choose to not take your medication or to workout despite knowing you shouldnt, then that is a choice which takes you further from recovery. Dont blame yourself for being sick, but take YOUR power back to recover. You do have the power and strength to recovery, even if it is just tiny, baby steps... they make a difference, but you have to be willing to change as well. 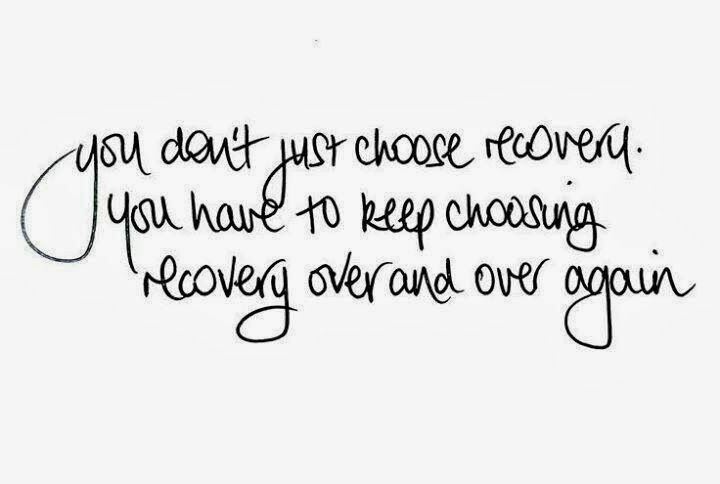 Stop thinking about the past and the "what ifs", instead focus on the present and the future and what you can do now to make things better and to choose recovery, not your illness. Dont blame others and dont blame yourself, instead decide to make a difference and to get better and get your life and strength back!